Happy New Year! I wanted to come check in before that saying became old. I think you have about a week to wish someone Happy New Year, then it’s back to business as usual. When I first started blog back in 2012, I was super excited because I had just became a homeowner a few months prior, and it was the blogs of others that helped me develop my current style. Because others had inspired me for so long, I wanted to do the same which is where my blog came from. Anywho, I am saying all this to say that I have been thinking about where I want this blog thing to go and grow. I love sharing the home/DIY stuff, but I am so much more than that, and so is living pretty on a penny. It means living life just as the motto under my blog header says: Creatively, Beautifully and Frugally. Creatively by thinking outside of the box. Checking multiple avenues to find ways to save money or designing a life that is meant for you, not what you think others should see or what they want. Beautifully meaning waking up each day is a beautiful blessing that should be embraced. Embracing it by going after the things that God wants for your life. Living each day with a purpose and on purpose. We are all here for a reason, and I am personally on a mission to find out what that is! Lastly, frugally. Frugally means to me finding ways to enjoy life without depleting the bank. I have found so many ways to enjoy my life without spending alot or going into debt, and I know their are many more. I want to share these things. I have never been the one in a rush to finish a particular project or room just to get blog content. My home is not for show even though I do show it here on the blog. It is lived in, so I like to take my time and make sure that things work for my family and my life. Its not always only about the prettiness, but about the functionality. I will continue this mindset into 2015.
along with seeing my normal home decor/DIY content, I will be throwing more content in that relates to my life and how I live by my blogs mission (Creatively, Beautifully, and Frugally). Take my time as I design and showcase projects. Its not always only about the prettiness, but about the functionality. Post once every other week by better planning in advance. More if possible. Clean and organize garage in the Spring so I can park my car in it! If you feel stuck in a rut and are ready to think about what this next year will hold for you, then I encourage you to do one. 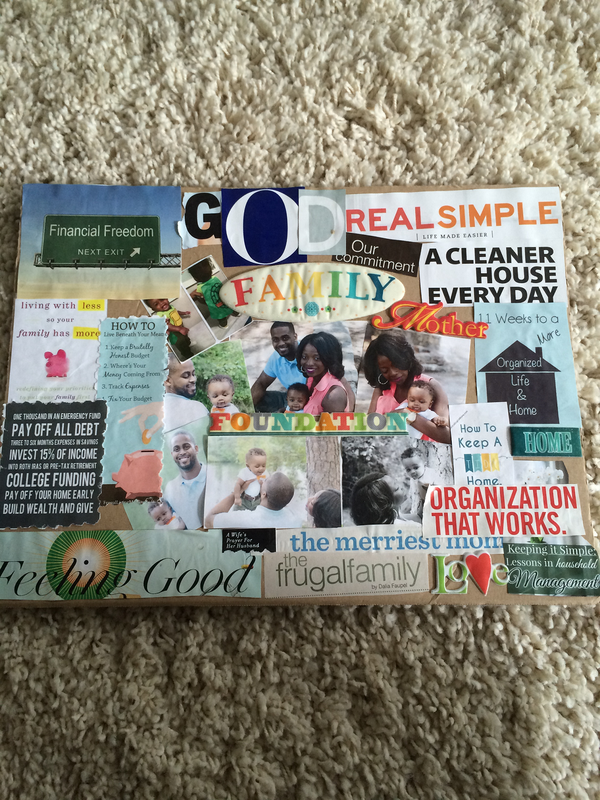 I have been there, and this vision board helped put things into perspective. Plus, they are really fun. As always, thanks for sticking around and reading along over these past 2.5 years. I love blogging and you guys have made it more rewarding than you will ever know. Love this Erin. It really is about being true to yourself and your beliefs. This post really resonated with me and why I started a blog too. To inspire little and big successes that improve home life and are not just blog content. Not to talk junk, but there is so much blog filler and over sharing these days, you can get lost. But I too want to get back to my roots of being a lil' slice of inspiration. Best of Luck to you in 2015. P.S. I did the 52 week challenge last year and it felt so good to put that money aside, to finally be a saver. Really enjoyed your post, Erin!!! Good luck with all of your goals! Cheers to an amazing new year ahead! love reading your personal and blog goals – I have a feeling 2015 is going to be a fantastic year! Hey love. Love your goals list and your vision board. Heres to an amazing year my gorgeous friend! !